We previously saw a leaked image of a device which was reported to be the new OnePlus 6 smartphone. Now Evan Blass has posted a picture of the device on Twitter and it appears to feature some sort of wood on the back of the device. The previous picture that we saw showed a glossy back on the rear of the device so it is possible that it may launch with different finishes. 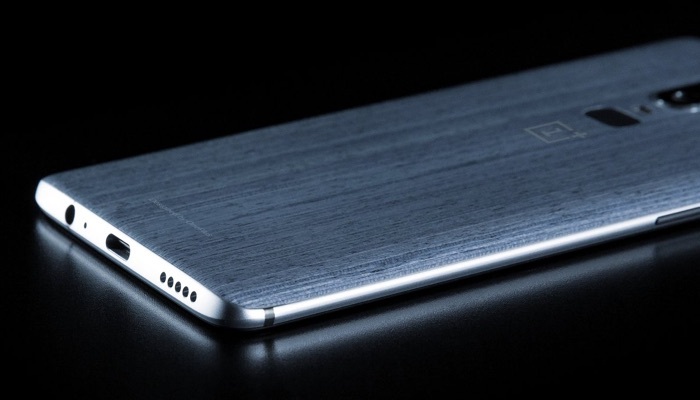 The new OnePlus 6 is rumored to come with a 6.28 inch AMOLED display that will come with a FHD+ resolution of 2280 x 1080 pixels. The handset will come with a Snapdragon 845 and 6GB of RAM plus 128GB of storage. There will apparently also be another version of the handset with 8GB of RAM and 256GB of storage. The device will come with three cameras. On the back there will be a dual camera setup of one 20 megapixel camera and one 16 megapixel camera. On the front there will be a 20 megapixel camera for Selfies. The new OnePlus smartphone will come with Android 8.1 Oreo and will have a 3450 mAh battery, the device will have a notch at the top of the display like the iPhone X. As yet there are no details on a launch date, as soon as we get some more details, we will let you guys know.